In our family, ginger (zingiber officinale) is often used as a herb to aid postpartum mothers in their recovery period during the first month. I remember grandmother cooking Tapai Chicken (Rice Wine Chicken) with a generous amount of ginger. Some of us have taken a great liking to it, and the dish is now a regular appearance on the dinner table all year round. I was taught to cook this in my teens. It is mentioned in the book 'HERBS' that ginger has medicinal purposes. Soothing menstrual cramps is another one of its benefits. I habitually use ginger in my cooking when I want a little spicy oomph in my meal that doesn't involve using the chilli. This is such a recipe. 2) Saute ginger for awhile. It will be quite dry. 3) Add chicken. Stir for a bit. Then, add the pumpkin. 4) Add water and oyster sauce. Mix well and leave to gently boil. 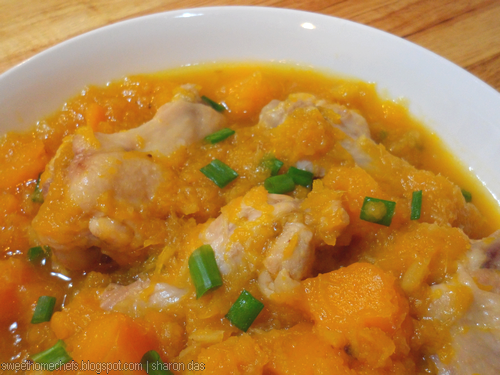 5) Simmer until the pumpkin is tender and the chicken is cooked. This took between 5-7 minutes for me. 6) Using the spatula, mash the pumpkin a little. Switch the heat off. Stir in the corn flour mixture to thicken the gravy slightly (optional). 7) Finally, stir the spring onion in. 1) Grated ginger. 2) Cubed pumpkin. 3) Rinsed chicken. 4) Sauteing ginger and chicken. 5) Adding pumpkin into the mix. 6) Season and leave to simmer. 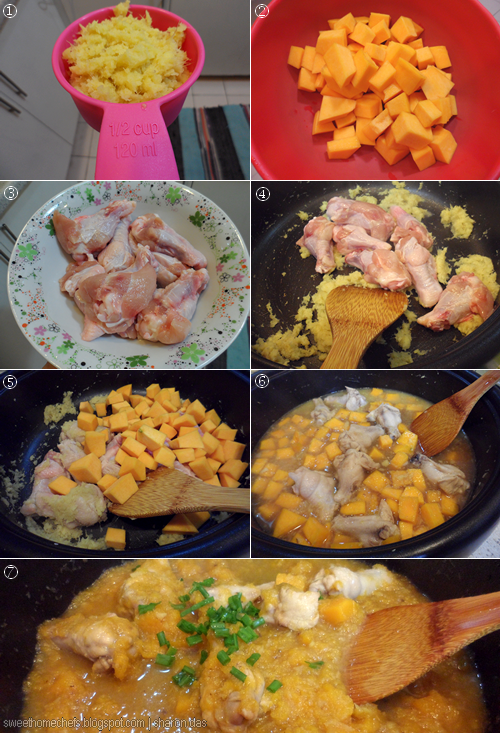 7) It's done when the pumpkin is tender and chicken is cooked. I made last time pumpkin's cookies, but with chicken it can be also great! My parents like using ginger too. This looks delicious. o yes, I love gingery dishes. This is a great fall dish, Sharon.